Celebrity Book Clubs are all the rage right now. Many readers are looking to them for book recommendations and you can’t miss them if you follow #bookstagram on Instagram. Though you may love certain celebrities on TV or the big screen or through their music, does that mean your reading taste lines up with theirs? Should you be listening to their book recommendations? That’s exactly what we’re going to figure out here. I analyzed every Book Club selection from the major Celebrity Book Clubs since each one’s inception and created The Ultimate Guide to Celebrity Book Clubs. In this post, I’ve summarized the general reading taste of each Celebrity Book Club, so you can find the ones that best match your personal taste. AND…I’ve included a free spreadsheet to help you find your Go-To and No-Go Celebrity Book Clubs using actual data analysis (don’t worry, I’ve done the heavy lifting for you). I have to tell you that my Go-To Celebrity Book Clubs weren’t in the category I expected! This post contains affiliate links and I will be compensated if you make a purchase after clicking on my links (plus: here’s your Amazon Smile-specific affiliate link ). Every month, Reese chooses a story she loves and announces it as her pick. It’s all about #loveofstory. Many books you’ve probably heard of. Mostly popular literary fiction (more literary than Reese Witherspoon, but still fairly well known literary fiction). Members of her Facebook Group get to vote on each monthly book club selection. Highlights African American authors and topics. Some classics in the book club’s earlier days. High-quality works of fiction by both established writers and distinctive emerging voice with critical and commercial promise. SJP runs her book club as the Honorary Book Club Central Chair of the American Library Association’s Book Club Central. She now has her own imprint with Hogarth. The imprint’s first book, A Place for Us, came out in June. Mostly relatively popular literary fiction (but not “popular fiction” like Reese). Every month, Emma Roberts and Karah Preiss choose a different book and a favorite independent bookstore. As part of my work with UN Women, I have started reading as many books and essays about equality as I can get my hands on. Diverse books focusing on women, their struggles, and empowerment. Meetings take place in the Our Shared Shelf Goodreads Group. Now has a Random House publishing deal. A healthy mix of serious literary fiction, nonfiction, memoirs, mystery, YA, and Sci-Fi. Every month, Andrew picks a “Rookie” choice for young readers and a “Veterans” pick for adult readers. A book club dedicated to Florence Welch’s love of reading, the club are given a read recommendation every few months by Florence or one of her friends, and anyone who wants to join in on the big read can do so. Afterwards, everyone gets together for a discussion about the book. A healthy mix of classics, contemporary literary fiction, contemporary memoirs, and poetry. Chooses a lot of lessor known books and books from indie publishers. What are MY go-to Celebrity Book Clubs? Ashley Spivey’s #Spiveys Club is my number one, Celebrity Book Club! Reese Witherspoon’s is in second place! It’s clear that I fall in the “popular fiction” bucket, which is interesting because I would’ve thought I’d be in the Serious Literary Fiction category. I guess I’m not as high-brow as I thought! What are MY no-go Celebrity Book Clubs? Lena Dunham and Emma Roberts are my top no-go Celebrity Book Clubs. I’ve read some of each of these celebrity’s picks, but I haven’t liked the majority of the ones I’ve read. Download the spreadsheet via the sign-up form below. Click the link that appears at the bottom of the blog post to access the spreadsheet. Follow the spreadsheet’s instructions to find your Best and Worst Celebrity Book Club matches. Using this guide, who are your go-to Celebrity Book Clubs? Sign up for my email list and get my "Go-To Celebrity Book Club Calculator"! Find the Celebrity Book Clubs that best match your reading taste...by using this easy template! You'll also receive all new blog posts in one weekly email. Plus, news of special updates and offers! Awesome post! I’ve heard of some of these book clubs but certainly not all – thanks for such a comprehensive list. I’m definitely going to explore #Spiveys Club, which I’ve never heard of until now! This is fun! I haven’t paid a lot of attention to the celeb book clubs, but I love that so many are promoting reading. It’s too bad The Orphan Master’s Son didn’t work for you. It’s been a few years, but I remember loving it. PS–I signed up but haven’t received an email yet. Are you seeing me in your list? Ashley Spivey was also my top result (I’ve never heard of her or Andrew Luck, though). Lena Dunham was second, but I think SJP’s actually appealed to me more–Dunham’s selections were good, but there were fewer (and I’m not a huge fan of hers). It’s great seeing the full list of selections for all of these! Very cool. I didn’t know Sarah Jessica Parker did one or Emma Roberts. I’ll have to check some of them out! This is great! The only celebrity book club I follow is Reese Witherspoon’s. I have to admit, I don’t really like most of her choices, but it’s fun to see people get so excited about reading! I also like the sound of Andrew Luck’s club – I like that he picks two books and appeals to younger and older readers. I’m hit and miss with Reese. Some of her picks are way too popcorn, but I’ve been impressed by others….You Think It, I’ll Say It and This is the Story of a Happy Marriage. And, I love that Andrew Luck can bring reading to a whole different segment of the population! Before he started his book club, the media was calling him the NFL’s librarian. Great roundup! Reese, Ashley, & Oprah are probably my best matches, though Andrew sounds good too. I”m not as much of a fan of clubs that pick safe classics. Me either..been done a million times over in school. I have to admit that I don’t put much stock in celebrity book clubs, but it’s so fun to see the differences here. (You always have such great ideas!) It looks like Ashley Spivey is my best match. Better go join her Facebook group! Awesome! Did you join her Facebook group?! Great post, Sarah. I’ve had trouble with many of them so have now sworn them off. Perhaps I’ve been rash. Maybe I should give Ashley Sprivey’s a try. Check out her Facebook group and see if you like it! Sarah, I love this post – how fun! 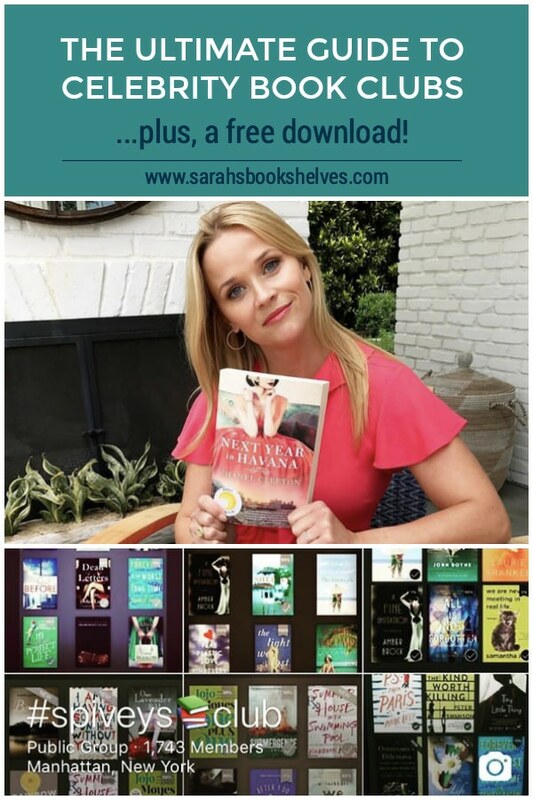 It seems Reese Witherspoon and I agree on many of the same books although I just finished her recent pick, There’s Something In the Water, and was was super disappointed. I’ve heard really mixed reviews about Something in the Water, so I’m not surprised to hear your take. She’s had a couple questionable picks – Last Mrs. Parrish is another one. And I’m with you on The Immortalists! What an over-hyped mess! Sarah, thank you this was FUN!! I have no idea who Andrew Luck is, but I like his book choices apparently!! I’ll be checking him out. After reading your blog I wasn’t surprised that Emma Roberts was my least favorite. SJP, Florence Welch, and Oprah rounded out my top 4. Hope you’ll do this again next year. Glad you enjoyed it! Andrew Luck is the QB for the Indianapolis Colts…he was a star at Stanford. He’s said to be the smartest player in the NFL and the media dubbed him “the FNL’s librarian” before he started the book club. I know…I was totally in the minority on A Gentleman in Moscow!